An amulet (from Latin amuletum; earliest extant use in Natural History Pliny) is "an object that protects a person from trouble." Amulets were originally objects worn about the neck or other parts of the body to prevent or cure diseases. The ancient belief that spirits were the cause of disease meant that amulets could ward off the evil spirits. Amulets were believed to be either naturally imbued with powers or they were given powers by spiritual leaders. Closely related to the amulet is the talisman (from Arabic tilasm; ultimately from Greek telesma or from the Greek word "talein" which means "to initiate into the mysteries"), which is any object intended to bring good luck or protection to its owner. Amulet collecting has become a modern phenomenon and amulets are still used today for protection from modern manifestations of evil. Throughout history, on every continent and in almost every culture, it has been held that amulets have offered protection against negative forces. Egyptians believed that amulets had powers not only during life, but also in the afterlife. Egyptian amulets' powers came from following strict instructions written in the Book of the Dead. Amulets were carried or used in necklaces, bracelets, and rings. The Egyptians used a frog to protect fertility; ankhs symbolized everlasting life and generation; the udjat, or eye, was for good health, comfort, and protection against evil; the scarab beetle was for resurrection after death and protection against evil magic. These were frequently found in the bandages of a mummy to ensure the deceased a safe, healthy, and productive afterlife. 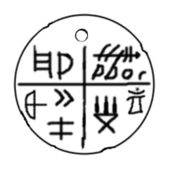 Drawing of clay amulet unearthed near Săliştea, Alba, Tǎrtǎria, Romania. One of the best known amulets of ancient Egypt is the Eye of Horus. Horus was an Egyptian God. The amulet consisted of an image of an eye and eyebrow, along with a stylized beard, the symbol of divine kingship. In Asia, figures of elephants are said to attract good luck and money if one offers banknotes to them. In ancient China, capturing a cricket alive and keeping it in an osier box attracted good luck (this tradition is also found in the Philippines). The Chinese would also sometimes spread coins on the floor to attract money. Rice also had a reputation for attracting good fortune. For the ancient Scandinavians, Anglo-Saxons, and Germans, the rune Eoh (yew) protects against evil and witchcraft; a non-alphabetical rune representing Thor's hammer still offers protection against thieves in some places. The ancient Celts, believed the clover, if it had four leaves, would bring good luck. This is different than the Irish shamrock, which symbolizes the Christian Trinity. In ancient African culture, the carrying of an animal's foot, or other parts of a swift creature, was supposed to help a person escape or flee with the speed of the animal. This “lucky rabbit’s foot” charm was handed down and assimilated into modern western culture by the enslaved Africans who were brought to the New World. Amulets also permeated almost every aspect of the Native American culture. Any small object could function as an amulet, but they all symbolized the power of a certain spirit. Amulets were given especially to children because they were considered to be the most vulnerable to the bad forces of the universe. A belief in the Evil Eye is almost universal and intimately linked to the use of amulets. Amulets specifically designed to protect against it have been found on every continent of the world. It was first recorded by the Mesopotamians about five thousand years ago in cuneiform on clay tablets, but may actually have originated as early as the Upper Paleolithic age. It was widely believed by the Ancients that certain envious or evil people could induce sickness and death merely by casting their eye on another person. These beliefs gave way to the birth of many amulets and charms. In the sixth century B.C.E. the Greeks manufactured black-figure wine drinking vessels (literally known as “eye vessels”) with exaggerated eye figures on them, which were believed to prevent evil spirits from entering the drinker’s body while drinking wine. In some Asian and African cultures the Evil Eye is also associated with eating and drinking because the soul is thought to be more vulnerable when the mouth is open. Potential amulet materials include gems or simple stones (every zodiacal sign has a corresponding gem that acts as an amulet, but the type of stone varies according to different traditions), statues, coins, drawings, pendants, rings, plants, animals, etc. Even words said at certain occasions could be used as a form of amulet. For example: vade retro satana (Latin, "go back, Satan"), was used to repel evil or bad luck. Perfumes and essences (like incense, myrrh, etc.) also serve to attract or repulse. In Central Europe, people believed garlic kept vampires away, as did a crucifix. Corals, horseshoes, and lucky bamboo also allegedly make good amulets. Evidence of religious objects serving as amulets was not limited to the ancient Egyptian culture. In Thailand, more than one Buddha hanging from peoples necks is a common sight even today; in Bolivia and some places in Argentina the god Ekeko is a standard amulet. Because the Second Commandment of the Old Testament forbids the making of idols to represent God, Jewish amulets, also called Khamsa, emphasize text and names—the shape, material, or color of an amulet makes no difference. 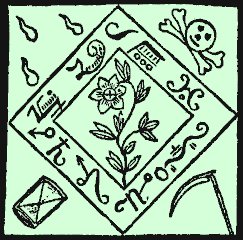 The Seal of Solomon is probably the best known of Jewish amulets. It was said to be a magical signet ring possessed by King Solomon, which variously gave him the power to command demons (or jinni), or to speak with animals. Another Jewish tradition is the kimiyah or "angel text." This consists of names of angels or Torah passages written on parchment squares by rabbinical scribes. The parchment is then placed in an ornate silver case and worn somewhere on the body. The Jewish tallis (Yiddish-Hebrew form; plural is talleisim), a prayer shawl with fringed corners and knotted tassels at each corner, is a talismanic object that was originally intended to distinguish the Jews from pagans. The Jewish name for the prayer shawl is very close to the more ancient term "talisman." In antiquity and the Middle Ages, most Jews, Christians, and Muslims in the Orient believed in the protective and healing power of amulets and talismans as a result of pagan conversions. There is evidence that they all used their holy books in a talisman-like manner in grave situations. For example, a bed-ridden and seriously ill person would have a holy book placed under part of the bed or cushion. Christian authorities have always been wary of amulets and other talismans. Believing that the reliance placed upon amulets demeaned one's faith in God, in the fourth century the Council of Laodicea forbade the clergy to make amulets and those who did were threatened with excommunication. But even with such restrictions, their most holy symbol, the cross, was often used as an amulet. An upward cross drove demons and vampires away, but when turned upside-down, it was viewed as favorable for communication with demons and to show friendship towards them. Even in the nineteenth century the Carlist soldiers of Spain wore a medal of the Sacred Heart of Jesus on their chests with the inscription ¡Detente bala! ("Stop, bullet!"). In Afro-Caribbean syncretic religions like Voodoo, Umbanda, Quimbanda, and Santería, drawings are also used as amulets, such as with the veves of Voodoo. These religions also use colored candles as amulets. The candles are believed to have different effects of attraction or repulsion based on their color. African Voodoo ceremonies used a Mojo or luck bag that carried many lucky objects or a spell. Mojo bags are still popular today as many advertisements in magazines and on web sites promote their use and distribution. Buddhism also has an ancient talismanic tradition. In the earliest days of Buddhism, just after the Buddha's death around 485 B.C.E., amulets bearing the symbols of Buddhism were common. Symbols such as conch shells and the footprints of the Buddha were commonly worn. Sometime around the end of the second century B.C.E., Greeks began carving actual images of the Buddha. These were hungrily acquired by native Buddhists in India, and the tradition spread. The use of tattoos on the body as amulets is found in many different cultures. The Christian Copts used tattoos as protective amulets, and the Tuareg still use them today, as do the Haida Canadian aborigines, who bear a tattoo of the totem of their clan. Some Thai Buddhist laypeople are tattooed with sacred Buddhist images, and even monks are known to practice this form of spiritual protection. The only rule, as with Jewish talismans and amulets, is that such displays may only be applied to the upper part of the body, between the bottom of the neck and the waistline. In 2004 the war in Darfur, Africa's largest country, was reported to be a boon for the business of makers of hijabs, leather-pouch amulets believed to ward off harm. They are reportedly worn by all sides of the conflict. The same type of demand for modern day amulets is found in Thailand. In Thailand, amulets believed to offer magical protection against bullets and other violence are sought by those involved on both sides of the country's war on drugs. Thailand also has the distinction of being one of the biggest markets for collectors of antique Buddhist amulets. It is actually an industry that has a significant impact on the country's economy. In 2003 there was a 40 percent increase in demand for the ancient amulets that coincided with Thailand's recovery from a 1997 recession. In Israel amulets play a role in the modern electoral process. 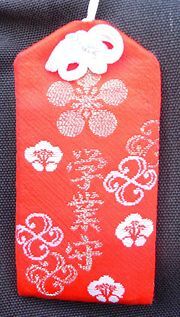 During elections the amulet industry is supported by political parties, encouraging citizens to vote "the way God intended." ↑ Dan Rave, King Solomon's Amulets. Retrieved June 14, 2007; Yronwode, Catherine, The Hamsa Hand. Retrieved June 14, 2007. ↑ Ahuva.com, For the Love of Israel. Retrieved June 14, 2007. ↑ Jewishbazaar.com, Judaica for all Occasions. Retrieved June 14, 2007. ↑ Tewfik Canaan, "The Decipherment of Arabic Talismans," The Formation of the Classical Islamic World 42 (2004): 25-149. ↑ New Advent Catholic Encyclopedia, Use and Abuse of Amulets. Retrieved June 14, 2007. ↑ Bill Ellis, Lucifer Ascending: The Occult in Folklore and Popular Culture. (University of Kentucky, 2004, ISBN 0813122899). ↑ Siamese Dream, Siamese Dream. Retrieved June 14, 2007. ↑ Somini Sengupta, Darfur War Raises Profit for Makers of Amulets. Retrieved June 14, 2007. ↑ The Nation (Thailand), Trade in Antique Amulets Soaring. Retrieved June 14, 2007. ↑ Michael Marmur, Boom Time for Amulets. Retrieved June 14, 2007. Hassett, Maurice M. Amulet. Catholic Encyclopedia. Yronwode, Catherine. The Lucky W Amulet Archive. Stratos, Anita. The Charm of the Amulet. Japan National Tourist Organization. Good Luck Talismans. This page was last modified on 21 March 2016, at 20:06.